Last year I jumped the gun a bit by discussing JWD's trip aboard the "George Peabody Boat"...aka...the SS George Peabody. It was in reference to...well....this letter. I finally get the opportunity to share this letter with you on the 150th anniversary of its creation. Yesterday, I finished reading the book "The Crater", by Newt Gingrich and William Forstchen. I was drawn to the book by the novel aspects of the Battle of the Crater at Petersburg, Virginia in July of 1864 and the direct involvement of the 48th PVI in the digging of the mine as well as the witnessing of the subsequent disaster. As I have mentioned in prior posts, JWD was part of the digging crew for the mine and suffered the consequences of spending those weeks in the tunneling environment to his health during and after the war. This is well documented by the post mortem pension application affidavits by fellow soldiers in support of his widow, Magdalena Derr. Well...you ask..."what does this have to do with a letter written in April of 1862".....nothing really...except that references in the book to the Burnsides Expedition to New Berne in 1862 and the fame that it afforded the general. The book illustrates how Burnsides was scape-goated for the post mine explosion battle. It also shows that Burnsides had successes in his career as well as other failures....e.g. Fredericksburg. It paints a very poor picture of General Meade. All of this is very interesting, but what I found most heartening was how the authors portrayed the mutual affection Burnsides and his men had for each other. 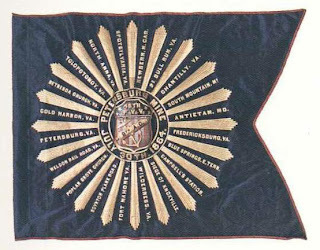 As part of the Ninth Corps, the 48th was part of that unit and spent most of its time under the command of General Ambrose Burnsides. The book also describes how Meade and Burnsides were deliberately separated from each other...both hating each other immensely...when the Ninth Corps was detached to the western theater (Kentucky and Tennessee) in 1863. The Ninth Corps was eventually brought back east as a support unit attached...but not part of...the Army of the Potomac. Lastly, the book describes the contributions of the 4th Division United States Colored Troops (USCT) and the 28th Indiana USCT. All of this was true, and I find it interesting that my GGgrandfather witness all of it....the glory...and the horror. This letter was written in April of 1862. During that period in the war, Burnsides planned and executed an assault on Confederate forces in New Berne, North Carolina as part of an effort to block shipping into and out of North Carolina, thus denying the south of an important import/export source to the outside world. The 48th was part of that order of battle and proceeded via ship, to transit up the Neuse River to join the battle. 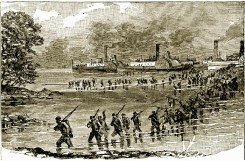 Unfortunately, the ships used by the Army to transport troops tended to be more intracoastal in nature and not equipped for ocean going service. Overloaded and underpowered, the SS Peabody was slowed by the elements and nearly capsized...arriving late to the battle. JWD describes how they arrived a few hours late to the battle and while missing the main action...they saw the results. That said...the 48th was subsequently used to transport ammunition and supplies to the troops in the field...their support being so helpful that General Burnsides recommended that the battle be added to the regimental colors. I take my pen in hand to write this few lines to you to let you know that I am well at present time and hope that this few lines will find you in the same state of good health. Further, I let you know that I had no time to write any sooner to you for we were moving all the time for a long time. Further, I let you know that if my wife wrote a letter to me and she wants me to give my trunk to her to put her clothes in and I told her should go to you and ask you or tell you if you would have a place to keep my clothes so that they don’t get spoiled, she might have my trunk and let me know about it. I wish you would let me know whether you drew my money or not, and let me know how much you got and when you got it. 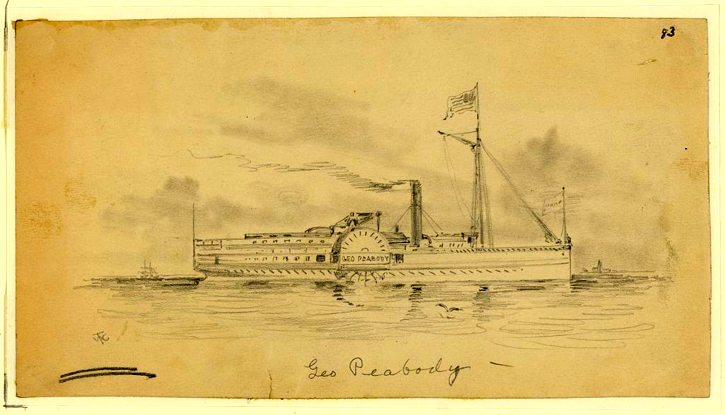 Further, I let you know that we left Hatteras on March the 13th, 1862 and went on board the “George Peabody” boat and went up the News (Neuse) River, and we were there to have a fight but till we were landed and came there we were about two hours too late for the battle. We saw nothing of the battle but we saw the dead men and horses laying around there like old logs. And it was night till we came there and we slept on the battle ground the first night under the bare heaven. And the next day we marched down till this side of New Berne and there we camped a while. But now we moved on the other side of New Berne and I think we will have another battle before we leave that place there. But we want to go after them. But General McClellan will come on their backs and make them run in our hands, and then we will mow them down like grass from the ground. Let the Fetterolfs know that I am well at present time. But now I must come to a close. Don’t forget to write to me as soon as you get this from me. Direct your letter to John W. Derr, Co. “D”, 48th Pa., Burnsides Expedition, North Carolina, in care of Col. James Nagle.